Meat-lovers will be facing the chop at a course on how to cook pork at a Marlborough butchers this month. And to prove it’s no flash in the pan, carnivores are also being offered lessons in cooking lamb, beef, game and offal, and rabbit and chicken. 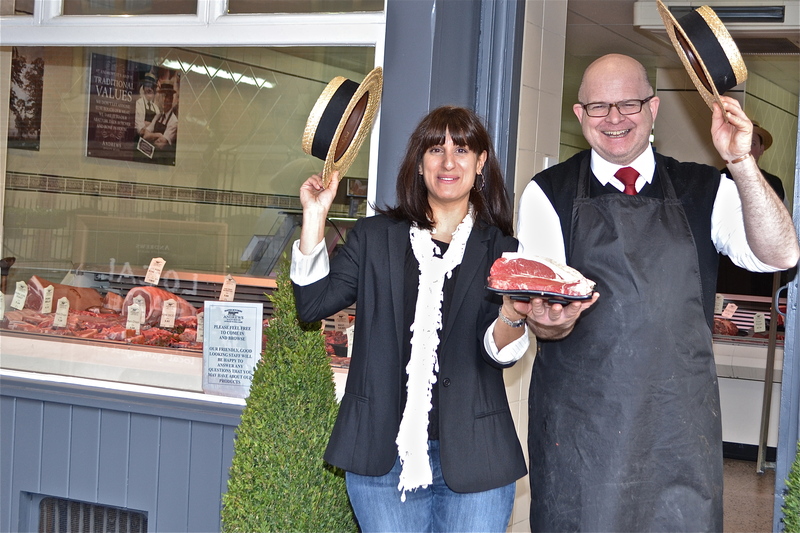 Cookery coach Androulla Derbyshire from Marlborough-based Culinary Capers and master butcher Andy Ayris of Andrew’s Butchers in High Street both have a steak in the new venture. The two met when food-lover Androulla ordered a “large” turkey to feed an extended family of 20 at Christmas. She ended up with a whopping 38-pounder, which she had to chop up to fit in her not-unsubstantial Aga. But despite the hassle she reckon it was one of the best turkeys she had ever tasted – and her dinner guests agreed. Androulla set up Culinary Capers with a mission – to teach people that it is as easy to cook from scratch than to buy and warm up ready meals. And Andrew, who opened the butchers – his third in Wiltshire – 18 weeks ago has a mission of his own: to instil in his customers an appreciation of good quality cuts of meat, and a concern for animal welfare. “All of our animals come to us in fur coats,” said Andy, “and we use every piece – nothing is wasted. “There’s far more to an animal than the traditional cuts you find in a supermarket. We’re seeing a growing trend for cuts like ox cheek and lamb shanks, from which you can create unusual and delicious dishes. Androulla and Andy’s pork and lamb courses will be held on Wednesday and Thursday, February 22 and 23. The beef course will be served on Wednesday, March 21, with game and offal the following day. Rabbit and chicken will be on the menu on Wednesday, April 25. Participants will start at 10am with a lesson on butchery. Cookery lessons will follow, and all the dishes cooked during the session will be served up at 1pm.